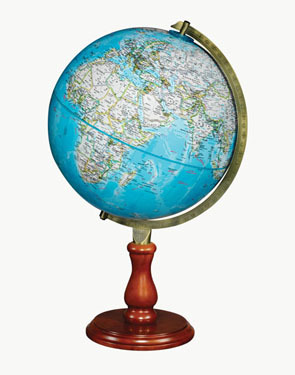 The National Geographic Hudson Desk Globe has a classic style that will appeal to all. Perfect for the classroom, office or study, the hardwood base is finished in a medium-toned walnut stain. Constructed of high-quality paper fiber, the globe ball includes raised relief and thousands of place names. Land masses are done in white with colorful geographical borders; oceans are vivid blue. Replogle's Hudson Desk Globe is backed by a one-year warranty.